The monks in the Junyung Gompa cannot continue their meditation practice as they have hardly any money to live on, not even for the most basic food supplies. They have to live with their families for most of each year and are therefore only able to dedicate a few weeks per year to their practice in the monastery. The Junyung Gompa, a place 'at which Vajrayana is taught and practiced' is situated approximately 700 km east of Derge in Eastern Tibet in an area called Dza Chu Kha. After more than 400 years of flourishing of the monastery - during which studies and meditation were carried out in a very pure way - the whole monastery together with all its statues was destroyed in 1959 following the invasion of the Chinese troops in Tibet. 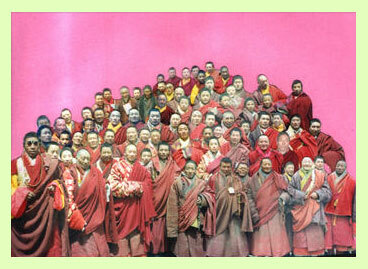 Today there are again approximately 120 monks and lay-yogis (Ngagpas) living in the parts of the monastery which have been restored, carrying out the original practice tradition. In previous times this entailed also intense group retreats during which a particular group concentrated for a set period of time on a particular practice. During the time in between, the monks dedicated their time to their individual meditation practice. Unfortunately this old tradition of intense periods of meditation can hardly be maintained due to a lack of funds. It is therefore the aim - with the help and support of practitioners the world over - to revive this old tradition of intense periods of meditation and to make it once again possible for the monks to live fulltime in the monastery of Mipham Rinpoche.